There's an information booth right on the Town Common across the street from the bus depot, but it's open in summer only. The prime source for tourist information in Amherst is the Amherst Area Chamber of Commerce, 409 Main Street, Amherst MA 01002 (tel 413-253-0700, info@amherstarea.com). 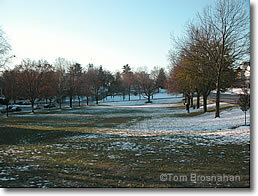 The Town Green in winter, Amherst MA.